Recently acquired is a full-size, color facsimile of the Golden Qur’an (Cod.arab. 1112), held in the Bavarian State Library (BSB) in Munich. 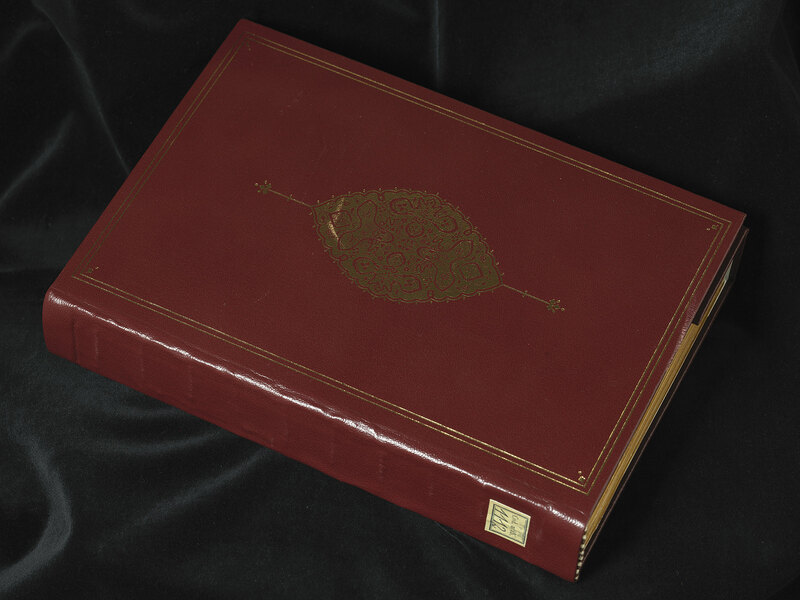 The original manuscript was restored by the BSB’s Institute of Book and Manuscript Restoration in 1967. This true-to-size facsimile replicates both the physical appearance and features of the restored codex. Some loss of the ornamental decoration along the edges indicates the text block was trimmed when the codex received a later binding. The Golden Qur’an is among a small number of Qur’ans written using colored writing materials. 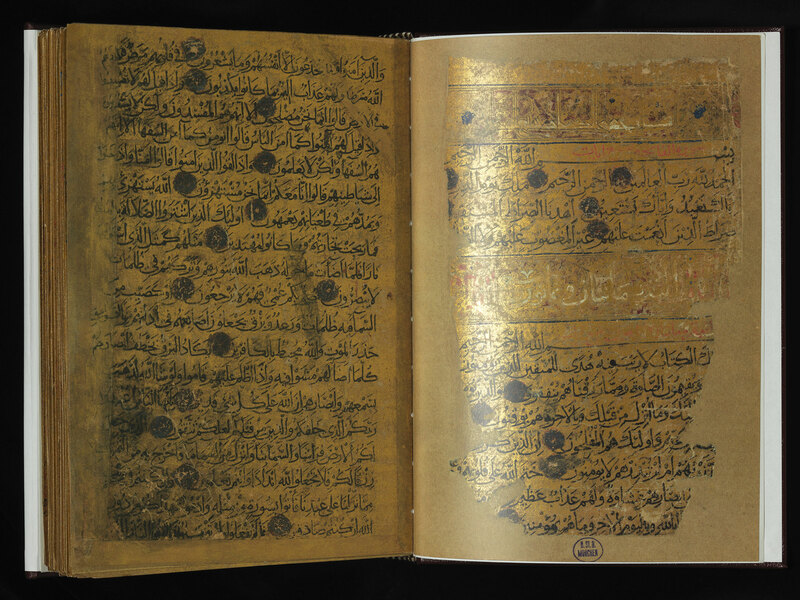 The most notable example of these colored works is the late 9th- or early 10th-century Blue Qur’an from Tunisia that was written in Kufic script on indigo-dyed vellum. The holy text in the Golden Qur’an is written in black Naskh cursive on gold-coated paper. The image below reveals the reflection from these golden pages. Each sura heading is framed in blue, white, and reddish-brown script and is decorated with floral and arabesque patterns. Verses are separated by rosettes. 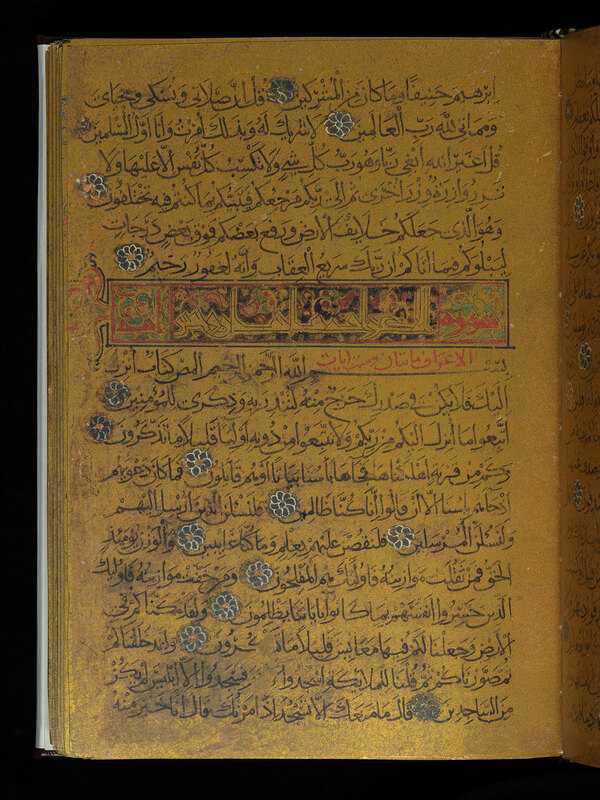 This Qur’an probably originated in Iraq or Iran. It has many features which indicate that it was a product of the school of Ibn al-Bawwab, the early 12th-century Persian illuminator and calligrapher. The Qur’an employs ink colors—white, brown, crimson, and black—that had been introduced by Ibn al-Bawwab. The vertical letters slant slightly to the left and are written in a dense but clear style that is characteristic of his school. In addition, the first page features an unusual arrangement of two sura titles. In the basmala (the name for the Islamic phrase which translates into English as “In the name of God, the Most Gracious, the Most Merciful”), the Arabic letter “sin” is elongated.